Welcome to Rome, Georgia Websites! We are a Rome, Georgia based website development and internet marketing company. Rome Website Services is owned and managed by Paul Parsegian. I have lived here for over 30 years now and I absolutely love it! I purchased a the Best Way Websites license for Rome in 2012. About 6 months ago I contacted Rome Georgia Websites (my Local Website Experts affiliate) about doing a new Website. I spoke with Paul and with Doug. Got a little info from both. Even though I found Paul's site because he was #1 on google for the search I did, I was still sort if sceptical, so I tried marketing my website myself, primarily using Google PPC ... thinking that this would be really simple. So I tried using Google PPC and 3 months later my phone still did not ring. I thought maybe I would just call the Local Website Experts back, so I did. It cost me a lot if wasted time and money for not using them first. Doug walked me through every aspect of making a working website, and so I hired them to completely redo my website and I also ordered their most basic SEO (Search Engine Optimization) program. They told me that it might take up to a year for me to see the kinds of results I was expecting. Well, it only took a few months and now our phone is ringing non-stop! If you will do what they ask you to, you will have that perfect website that actually works for you. Thanks Paul and Doug for all you help! ALL MOBILE RESPONSIVE WEB SITES! Solutions for Small Business Owners. Your Local Solution. Your Best Solution! We Provide Effective & Affordable Website Development and Internet Marketing for Small Business Owners. What does it cost to have your site properly developed by us as Best Way Websites authorized licensees? You can get your custom, compliant, attractive, fully mobile responsive website starting at just $100, so it won't break your bank to work with us! Even if you just want a 1 page site for now ($100), your site will still be beautiful, search-engine crawl-able, and it will look awesome on mobile phones, too! We Make it Easy for Small Business Owners to Grow and Manage Their Businesses by Creating, Marketing and Maintaining Attractive, Affordable & Effective Websites for Them. We know small business. We want to be a part of your team. We want to help you succeed with your online presence. We know how busy you are! We know you don't need more complications! ... and that is why we make it easy for you! If you want us to do everything for you, we will. If you want to do it all yourself, you can. It's up to you! We Will Provide You with as Much Help as You Want and Need so You can Focus on Your Business and Making More Money! Some business owners want "hands-on" when it comes to maintaining their websites, and some prefer to do what they do best and hire us as affordable experts so they can be free and "hands-off". We will work with you either way. You can subscribe to our super-easy website editor (CMS) or you can phone in or email us your website change requests. We leave it up to you. Our website design platform uses our own themed technology which is completely versatile. It is not a static and clumsy "templated" solution! We can design your site to look like anything you want and you will still be able to edit it using our website editor (CMS - Content Management System) if you want. On the other hand, if you have no idea what you want, we can put something together for you with what we have gleaned from our phone consult and show it to you. Our team includes expert programmers and coders! If it has anything to do with website development or internet marketing, we can do it and we can do it well! Most websites are "brochure-type" sites that include information: images and text descriptions. Brochure sites also typically make use of web forms. Web forms are easily included in our brochure site designs. Many brochure sites also include simple shopping methods as well. Our CMS includes a super-easy to use online store at no additional charge that authorizes via PayPal. However, your site may need or may be made more effective by using custom programming. We can integrate custom programming into your site, and you can still maintain it (if you want to) using our awesome, super-duper easy CMS (Website Editor). Do you already have a website? Great! Is it responsive to mobile devices (iphones and android phones)? No? Not so great. Nowadays, nearly 50% (or 70% or more for hospitality sites and restaurant sites) of your users will be trying to access your website using their smart phone. This is really bad news for you if your site is not "mobile ready", because nearly half of them will immediately click away if your site does not offer them a good experience. If you site is NOT MOBILE RESPONSIVE, it needs to be redeveloped. FAST! Let us help! Moblie-responsive sites are not simply visible on a smart phone, the layout and function changes for phones to ensure that users have a great experience. Check out this site on your smart phone if you have one and see how it responds! 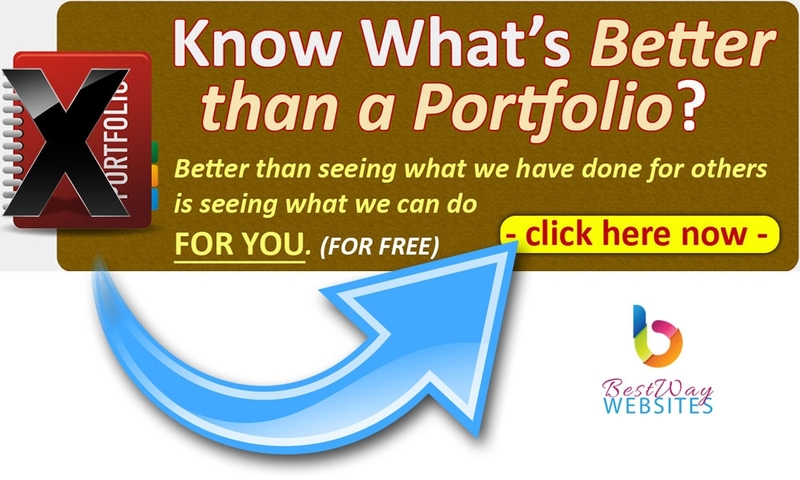 So, What's Better than a Portfolio? A Free, Custom Website Demonstration! We've created LOTS of websites. We could show them to you. However, we'd rather show you YOUR SITE instead. That's right, we will create a custom website demo (YOUR WEBSITE) for your review. If you like it, you buy it. If you don't like it, then walk away! 100% Risk Free. Because we used to do it another way, and it didn't work so well for us! We used to do a consult, draft a contract, accept a down payment and then present the site to our clients. This worked ok most times, but sometimes we thought we did EVERYTHING that they asked for and the still did not like it. So, we found a better way. 1) No money down. We don't even ask for billing information until AFTER you have seen your site and tell us you WANT to buy it. 3) We still do a free consult first. We can't hope to make something CUSTOM that you want without talking to you about what you want. 4) You tell us how much you want to spend on your site, - we don't care that much about the amount of your budget, we just need to know what it is so we can adjust your website demonstration accordingly. We do sites starting at $100. We've done LOTS of sites for $500 or so and many sites for a few thousand dollars. It all depends upon what you want. We need to know if what you want fits realistically into your available budget. Most often, we have discovered that our clients are willing to spend quite a bit more than what we charge. 5) We'll create your demo for your review and go over it with you. You may want a few minor adjustments. We can do most of these WHILE YOU ARE ON THE PHONE! If we totally miss the target (you honestly don't like the demo at all), we'll take responsibility for it, so don't worry. You're not on the hook. We can't say, "You're off the hook! ... because you were NEVER on the hook to begin with. You started with no risk and ended that way. We wish you well and no hard feelings! 6) However, if you are like the overwhelming majority of those that we create custom demos for, you will love what you see and will be surprised that it cost you less than what you have budgeted! 7) We'll accept a down payment and complete your site, usually within 3-4 days and then we will require the balance payment. What if What I Want Costs More Than What I've Got? Easy payment plans to the rescue. If you really want the site, but it is outside of your ready cash, we are happy to offer you an easy payment plan. All we ask is that you make as large a down payment as you can, and then YOU TELL US how you would like to pay off the balance. We want you to draft your own payment plan, KNOWING that you can fulfill it. Hey, if it's not something crazy like, "I'll give you $100 down and $10 a month for 10 years", we'll more likely than not accept it. We'd rather leave it up to you so you can comfortably pay for it. If you can pay within 90 days, we'll do it for you same as cash! Will Your Site Be Search Engine Friendly? Yes. Every site that we develop includes traditional, on-site HTML markup that includes conventional, acceptable (white hat SEO) search engine optimization. Search Engine Optimization (also called SEO) is so much more complicated now than it used to be, but the basic elements of good, on-page SEO have not really changed. If you are somewhat internet savvy, you may know the difference between "white hat" and "black hat" SEO. We only employ acceptable SEO practices. Results may not be as quick as trying to "fool" the search engines, but they will never get your site banned, either. What is Meant by "On-site" and "Off-site" SEO? There are external (or off-site) factors as well. In other words, content that is not on your website that in some way links back to your website has a lot to do with how highly your site is ranked in the organic search engine results pages. Internet marketing is all-inclusive and refers to any type of marketing online including: advertising on other sites, article creation and distribution, pay per click advertising (search engines), directory listings, social media marketing, local search marketing (paid), email marketing and more. We can advise you about what kinds of internet marketing would work well for your business and within your budget. Local search marketing or mobile search marketing? They are essentially the same thing. Search engines know that over 40% of searches performed from desktop or laptop computers have local intent. This means that even if the searcher does not type in locality (city name, for example) as a part of the search string, they are still looking for local results. Because of this, the major search engines have forged partnerships with traditional data aggregators because they have been collecting local business information long before search engines were created. Search engine results pages now contain information from the search engine's indexes PLUS results pulled directly from data aggregators. There are several data aggregators in the USA. Among the more prominent are: infogroup, neustar (localeze), axciom, and factual. In addition to searches performed from traditional devices such as desktops, laptops and notebook computers, the mobile-enabled devices in use continues to grow each month. Mobile-enabled devices are pads and smart phones (iphone and android phones). When mobiles are being used to conduct search - and over 50% of ALL search traffic is mobile already, the dependence upon data aggregators becomes more prevalent. In fact, in most cases it becomes primary and traditional search engines become secondary. If your business is a local business and you are serious about having visibility in local search, you must participate in a local search marketing program. You are a local business if you publish a business location or if your market is your immediate city or county, for example. If your business is strictly internet based and you are not dependent upon a local market(s), then local search marketing won't do much for you. Our basic local search marketing program covers all the major data aggregators and is a great place to start. We also develop five additional keyword based pages for our client's websites as a part of the setup process for basic local search marketing. Our advanced Local Search Marketing Program covers the major data aggregators as well as feeding your business's citation or NAP (Name, Address & Phone Number ... plus more business info) to over 300 directories. We are not simply professionals. A professional is someone that is paid for what they do. Someone can be a professional (PAID) and still be a novice (INEXPERIENCED). We are a completely USA based TEAM of EXPERTS. Your Website Consult is Free. Your Custom, Website Demo is Free. Copyright © 2019, Main Street Websites, Rome Georgia Websites | Paul Parsegian. Powered by Main Street Websites.